Well the great cheese Birthday party for Sas and I happened and what a fab night it was. Many thanks to everyone who came and to Pete Ashton for taking a great set of photos whilst there. 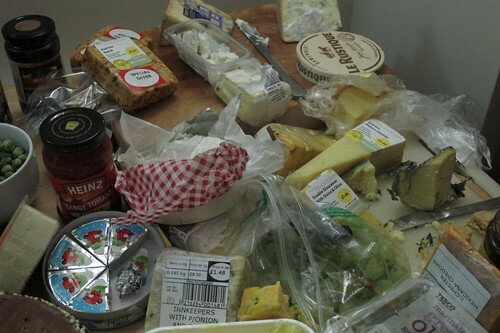 Even more thanks to those who brought some cheese to share – I know I asked you to, but I was truly flabbergasted by the amount of cheese that ended up on the big dining room table-come-cheeseboard. 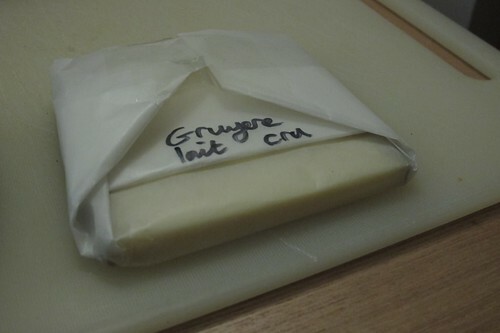 There was cheese of all shapes and sizes – from Midge?s Dairylea triangles to Michael Grimes’ gorgeous Gruyere, from soft to hard, from yellow to blue. As the night drew on and people started leaving I made them take big blocks of cheese home with them, party-bag style, but despite this party-host Carl still ended up with a fridge full to bursting with cheese, which we have been trying to gobble our way through since. Every meal was either cheese based or garnished with a heavy sprinkling of grated cheese. Snacktimes consisted of cheese and crackers. 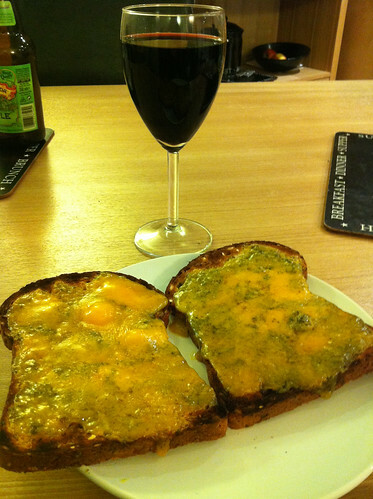 Breaking point came when Carl suggested a night-time snack of cheese on toast. I put the bread under the grill and took out the last piece of leftover Birthday party cheese – an unopened block of strange looking yellow-greeney-blue stuff. As I started slicing it, the cheese just seemed to crumble up. Thinking ?sod it, it needs using up anyhow? I put the whole lot onto the four slices of toast. I was of the opinion that more is more with cheese but it seems I was wrong – this cheese tasted and smelled like fungal feet and my overly generous helpings did the toast no favours. We only got about halfway through our first slice before chucking the rest away. I never thought I?d be glad to see the back of a fridge full of cheese, but I?m very thankful that was the last of it. Now Carl and I now find ourselves facing a new challenge – although all of the cheese has gone there?s still plenty of pickles, preserves and other cheese accompaniments people kindly brought along to the party. 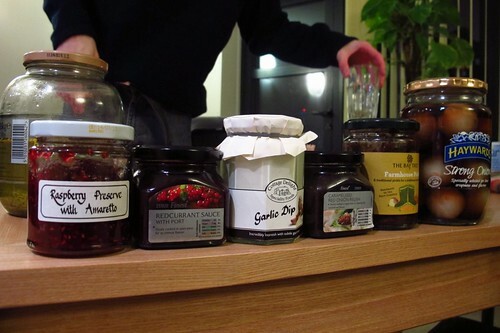 Thankfully these have a much later use-by date than the cheese did, so there?s no need to gorge on them, but I?m enjoying snacking on pickled gherkins and onions, and starting the day with some gorgeous Raspberry Preserve with Amaretto on my morning crumpets (thanks Nikki Pugh). Nom.